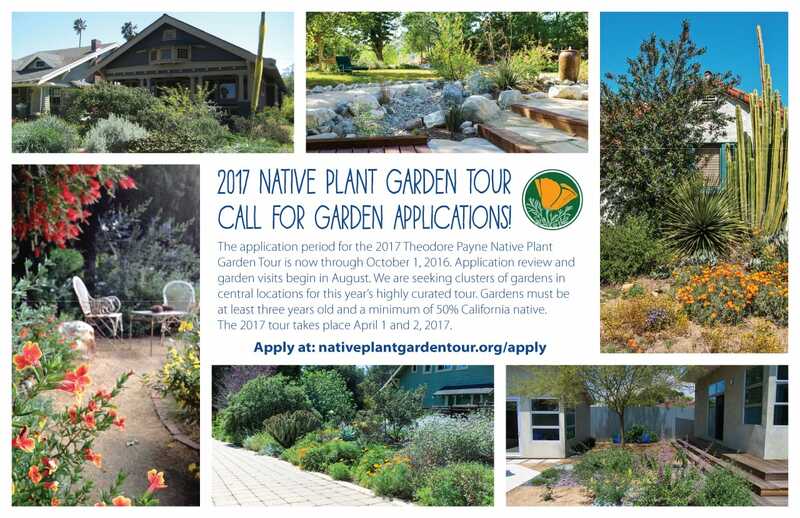 The Theodore Payne Foundation for Wildflowers and Native Plants is looking for those with outstanding native landscapes to participate in their 2017 Native Plant Garden Tour, held on April 1 & 2, 2017. This Garden Tour is Theodore Payne’s largest annual outreach event, and has been helping Angeleno’s experience the authentic and sustainable beauty of California native gardens first-hand for nearly fifteen years! Garden owners or designers interested in participating must complete an online application located here: nativeplantgardentour.org/apply The application period ends October 1, 2016. Gardens must be planted with at least 50% California native plants, and ideally be at least three years old as of 2017. More detailed information is found in the online application. conservation, Event, garden, sustainability, Theodore Payne. Bookmark.